Gary Cooper, in my view, was someone equally adept at drama and comedy. He could be that flummoxed everyman and the strong, determined hero. 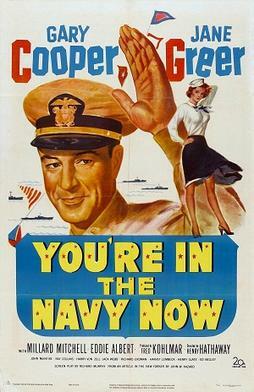 You're in the Navy Now tries to give him both sides, but its indecision as to where exactly to go costs it a chance to be either comedy or drama. In the early days of World War II, the Navy decides to test out a new ship with a high-power steam engine. No one seems willing or able to take command or man this experimental ship, so the Navy resorts to finding whomever they can lay their hands on. To command the ship they bring in Lieutenant John Harkness (Cooper), who has never had command of anything. However, his background as an engineer and Rutgers education it is felt will be invaluable. Harkness isn't the only one aboard with essentially no experience at sea. Out of his commanding officers, only Boatswain Larabee (Millard Mitchell) has been at sea. Everyone else among the officers is there due only to their college education. That is more than can be said for the crew, which has similarly no sailing experience. They are also displeased to be aboard this ship with that awful steam-powered engine, quickly dubbing the PT-1168 the 'USS Teakettle', a term so prevalent even the officers take to calling the ship the Teakettle. Each time the Teakettle tries to meet its target speed, it not only inevitably fails but manages to crash into another ship. Morale is low, and the Navy brass' growing impatience with the PT-1168 brings a decision to curtail their freedom (deny shore leave) until it can successfully pass a test run. This decision causes more problems, as the Teakettle's constant failures, despite the crew's best efforts, causes morale to sink lower, with fights breaking out everywhere and Harkness unable to get anything done. The fights, however, spark an idea: entering a crewman into the yard boxing competition. Seaman Wascylewski (an unbilled Charles Bronson) is the toughest sailor on the Teakettle, able to knock anyone down. With a little training from Ensign Barbo (Jack Webb), Wascylewski looks like a sure thing, down to the Teakettle's crew putting up major bets, with Harkness' tacit approval. Morale is picking up, until they learn the Teakettle will be doing another test run the day of the boxing match. The crew knows it will fail again, preventing them from gaining liberty, but this time they cook up a scheme to make the test a success. They smuggle in extra distilled water to keep the engine going, which is enough for them to meet their goal. Even after their success, Wascylewski has an accident just after the test run, forcing him to drop out and having another crewman, Morse (an unbilled Jack Warden) to substitute. Things come to a head when Admiral Tennant (Ray Collins) comes to see the Teakettle repeat their success. By now Harkness knows what the crewmen did but is too late to stop Tennant from coming. They try to bluff their way to another successful run but the Teakettle fails again. The ship soon starts going out of control and ends up crashing onto a destroyer, much to Tennant's embarrassment as he is the highest senior officer aboard. Ultimately, while the Navy abandons the steam-power idea, they find that inexperienced men can serve both the Navy and as officers, so now PT-1168, retrofitted with a diesel engine, can sail into the war. You're in the Navy Now now would probably be forgotten as the B-picture it is if not for some interesting details. It is not only the film debut of Charles Bronson and Jack Warden, but improbably is also the debut of Lee Marvin. It's a strange turn of cinematic events to see three future film stars all make their debut here. Oddly, Bronson, Warden and Marvin all played second fiddle to someone else making their film debut in You're in the Navy Now: Harvey Lembeck, best remembered as Eric Von Zipper, the comic foil in the Frankie & Annette 'Beach' films. You're in the Navy now is interesting in that we could see that these actors all could play against their future types. Bronson, who went onto fame as a screen tough guy, showed a surprisingly light, comedic touch. Lembeck, most associated with broad comedy, did have some comedic moments, but here he seemed perfectly adept at playing a slightly more dramatic role as Seaman Norelli. 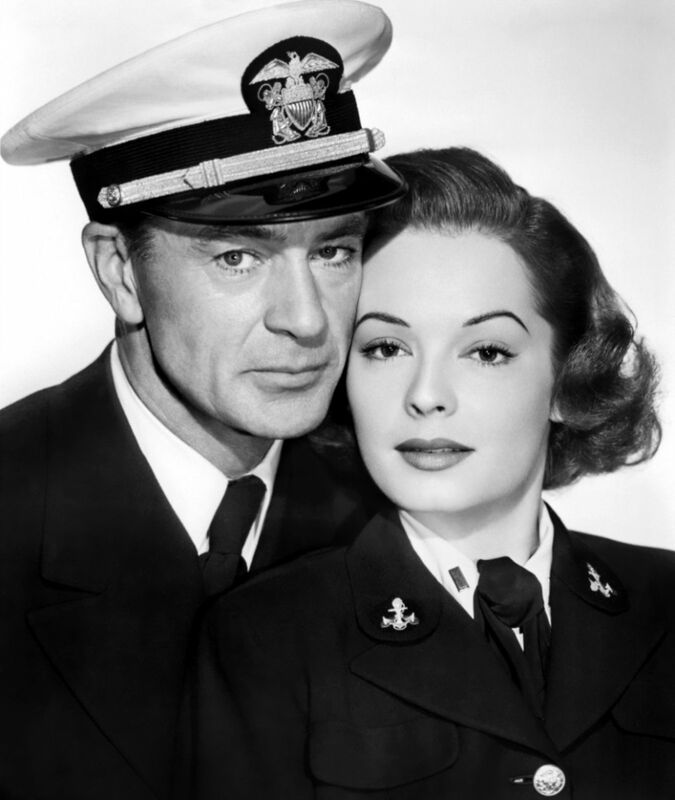 Gary Cooper showed moments of strong drama when attempting to make the Teakettle sea-worthy, and moments of comedy when being flustered if not downright bamboozled by the men and the ship. It was a good performance, and much better than the script he had. 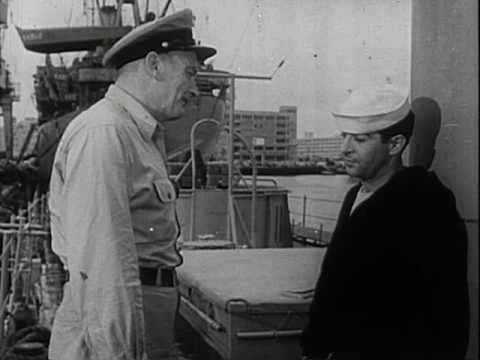 I blame the weakness of You're in the Navy Now on Richard Murphy's script and Henry Hathaway's direction. They really did try to have it both ways: a comedy with the Teakettle's constant disasters and a drama with the working life of the crew and officers. The tonal shift was not working, but the cast did give it their best try. Perhaps the worst aspect was the 'love story' between Harkness and his wife Ellie (Jane Greer). It's hinted that Harkness is jealous whenever his WAVE wife (the female Naval Reserve) is in the company of a handsome young man, but that story never went anywhere. Worse was the obvious age difference between Cooper and Greer. She at 27 looked far too young to be so madly in love with the 50-year-old Cooper. At the very least, it looked laughable to think these two would be romantically involved. At the very worst, it looked downright incestuous given that Mrs. Harkness was and looked old enough to be her husband's daughter! If Greer had played Cooper's daughter, then his worries could have been played for greater laughs, the anxiety of a father finding his little girl wasn't so little anymore. However, whether it was due to ego issues or Cooper's status as a leading man, the decision was made to have this very young woman play this rather old man's wife. From the get-go you think that Mrs. Harkness looks a bit young for old Coop. It was a bizarre decision that nowadays looks more bizarre. You're in the Navy Now is a trifle, worthy more for the cavalcade of future stars that populate it and at heart a nice story about comradeship that could have been better. It's not a bad way to spend a boring afternoon, but it isn't one to be remembered long after one has seen it.